Fortunately, although France is full of both supermarchés and hypermarchés, the French still love a proper, old-fashioned street market. Market day seems to be quite a social occasion with friends meeting and nattering whilst wandering around the vast array of foodstuffs and prepared foods on offer. Shopping for food is a very serious affair not to be hurried. 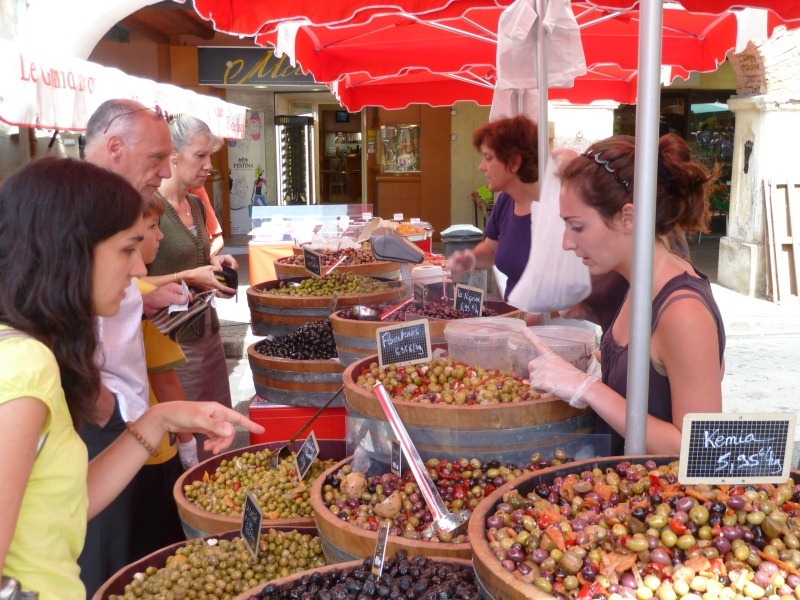 Here are a few customers discussing the finer points of olives with this particular vendor. During their market marathon, folks will sit at a street cafe and re-invigorate themselves with a cup of coffee or maybe even a pastis. It’s all great fun. The market at Sarlat-la-Canéda in the Dorgogne region has a reputation as “the finest market in France”, at least in some circles. It is certainly enormous; to my mind it is actually a bit too big and can seem somewhat daunting. 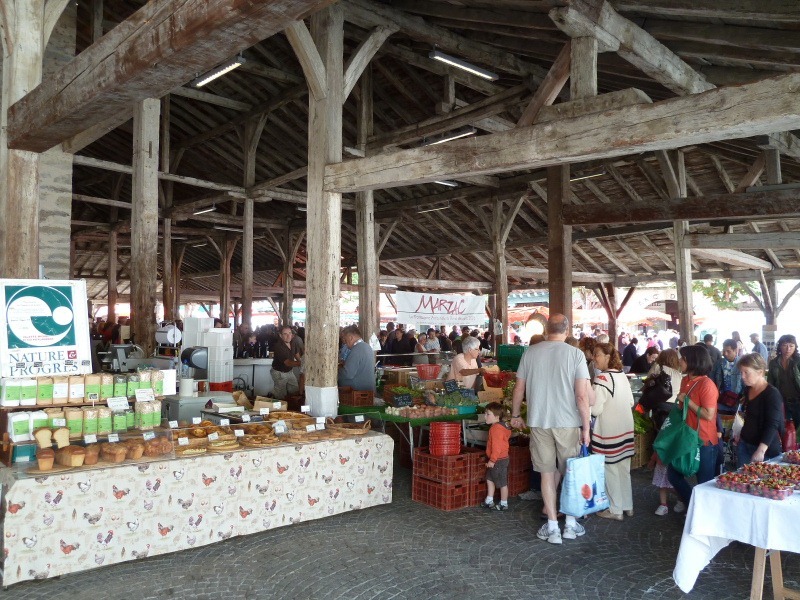 It is undoubtedly, though, a great place to buy the specialities of the Périgord region. 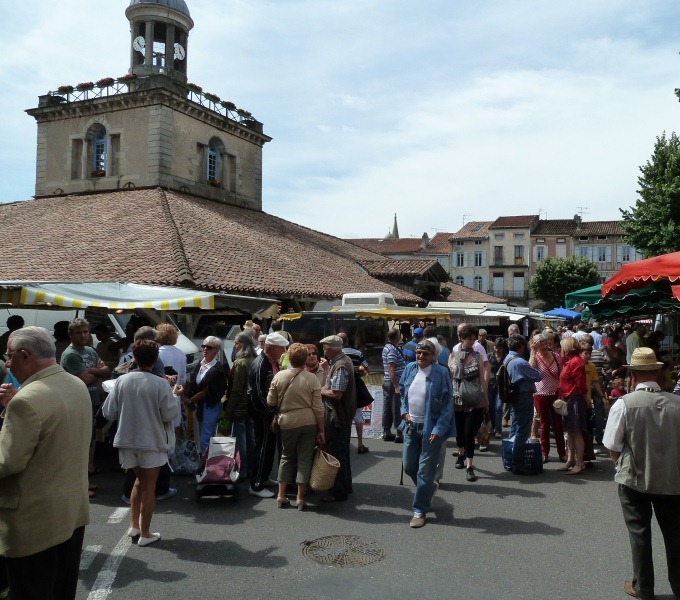 In this neck of the woods the market at Mirepoix is very good, albeit a little a touristy, often with English voices outnumbering the French voices once the season is underway. 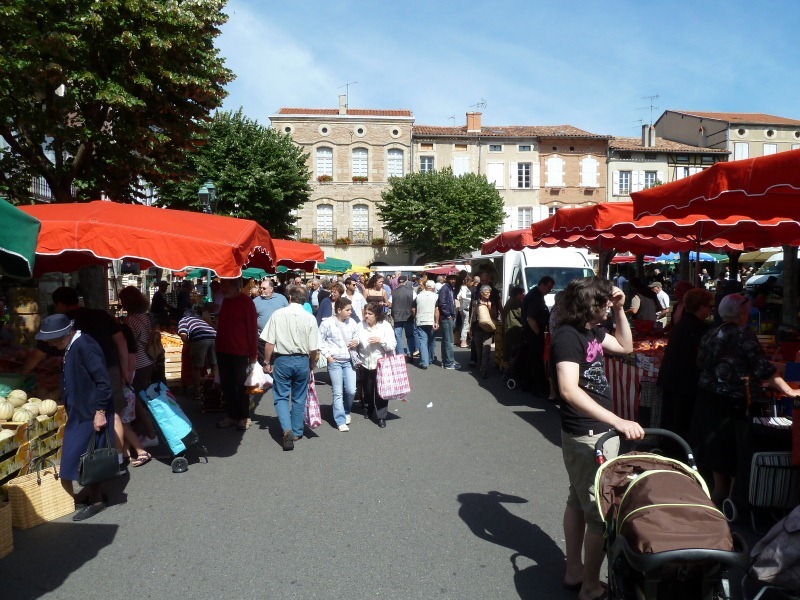 Our favourite market in this area must be the market at Revel, which is held on Saturdays and is very well attended by real, local French people. Revel has a magnificent square in the middle of town housing the old market hall constructed of some very impressive, clearly ancient wooden timbers. Doubtless, the woodworm think it’s market day every day. This shot shows about a quarter of the covered area. 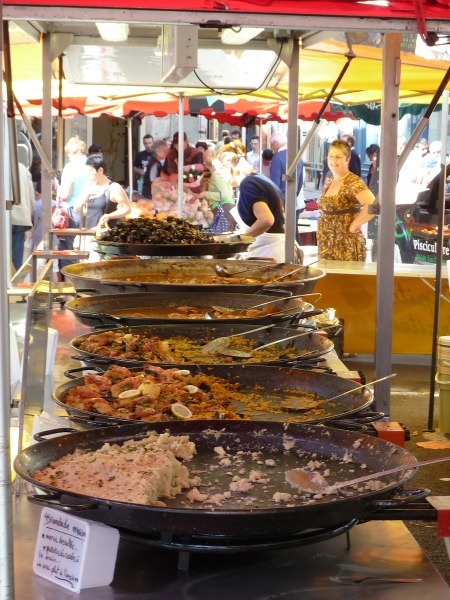 As well as raw ingredients, meat, fish and vegetables etc., several stalls sell prepared food. Here’s an example of a stall with at least six meals available, all cooked on the day in large paellas. [I desperately wanted to type “paella pans” but since paella means this type of pan, saying “paella pan” would have been like saying “pan pan”, if you see what I mean. Anyway …] On offer here, amongst others, are brandade (closest – a salt cod concoction), paella (the meal, not the pan) and moules (furthest away – mussels). We bought ourselves a sample of a local speciality called aligot which seems to consist of cheese and creamed potatoes stirred together into a stomach-cuddling, gooey mass with a large wooden paddle in un unfeasibly large pot. This made a change from our usual purchase of a poulet roti [rotisseried chicken] and we retired to one of our dragonfly lakes for a picnic.